Legal Status: Citizen of an unnamed Caribbean Island with criminal record in the US. Powers: His bionic body grants him superhuman strength, dexterity and endurance as well as resistance to injury. His snake tail is fourteen feet long superhumanly strong, prehensile and can also stretch to great lengths. His bionic arms house retractable six inch blades which are as sharp as needles and contain poison derived from snakes. After growing up poor his brother managed to dig himself out via crime. His first crime was a disaster after he was ambushed by cops. Attempting to flee he swam out to sea only to be run over by a police ship, losing his legs and arms. Disgusted his brother abandoned him after revealing his latest alias, Bushmaster. Wishing for death he was approached by a member of the serpent society who promised to replace his missing body parts. After many experiments he awoke to cybernetic arms and his legs remade into that of a snake’s body. When he heard of his brother’s death at the hands of Luke Cage he took the name “Bushmaster” to honor him and joined the serpent society. Working for Ghar of the lemurians he faced Storm of the X-men. During Civil War he became a registered hero and was a part of the thunderbolt army. After this he faced the Avengers and his brother’s killer Luke Cage. Recently he’s faced Misty Knight as he joined with fellow Black villains like Nightshade and Cheshire. 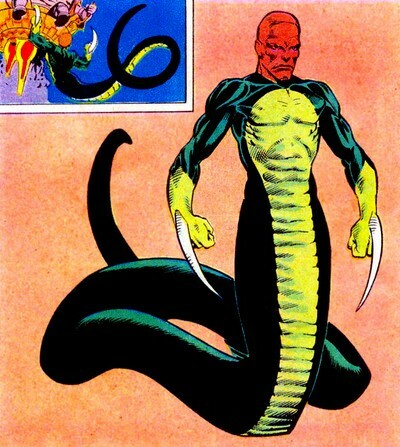 He also faced Marcus Johnson as part of the serpent society.